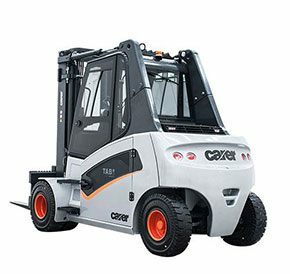 The newest series of Carer trucks, the A80X electric forklift has all the power of an internal combustion forklift with the added benefit of Carer’s electric forklift solutions. Designed specifically for outdoor environments, this new forklift series has fully protected electrical systems which prevent dirt and liquids from damaging important systems. The A80X features unique independent drive units with two 15kw traction motors and planetary drives. Also, hydro-drives provide optimal power consumption, enhanced maneuverability and traction control. Featuring a unique 96V operating system with two standard 48V batteries and a specifically designed hydraulic system, the A80X is perfect for multi-shift applications. This series easily replaces internal combustion trucks previously operating up to 4,200 hours per year without the need for additional spare batteries. Each drive motor is IP54 protected with up to 5400 rpm, ensuring the high torque and the protection needed to handle demanding outdoor applications. The A80X electric forklift has travel speeds of up to 20 km/h and lifting speeds up to 30 m/sec. Large diameter front and rear tires are a solid, super-elastic material which provides similar ride characteristics to a pneumatic tire with better traction in snow and icy conditions. Complete with a standard integrated rearview camera, fingertip controls, and exceptional visibility, the A80X gives operators the tools they need to safely and efficiently navigate job sites. To guarantee maximum comfort, each Carer electric forklift features ergonomic fabric heated seats with air suspension and lumbar support.